The Gallup Organization has been publishing books on management and high performance organizations regularly for quite some time. The encouraging elements in all of them are that they are based on real data from real people about real work. I have recommended two earlier books from Gallup, Marcus Buckingham and Curt Coffman, First, Break All the Rules: What the World’s Greatest Managers Do Differently, 1st ed. (Simon & Schuster, 1999) and Marcus Buckingham and Donald O. Clifton, Now, Discover Your Strengths, 1st ed. (Free Press, 2001). 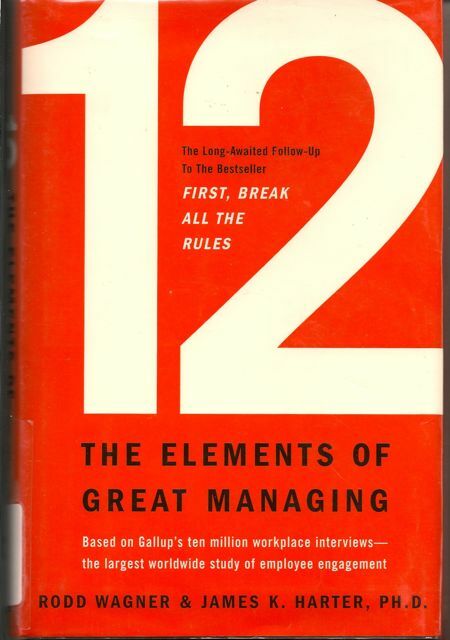 I recently read 12 The Elements of Great Managing by Rodd Wagner and James K. Harter (Gallup Press, New York 2006) another in this series. Don’t be deceived by the title, this book is really speaking from the perspective of how employees experience high-performance management. So a little translation is required to uncover the implied principles and practices of the 12 elements. Here are the twelve elements as presented in the introduction to the book((1)) . My associates or fellow employees are committed to quality work. A footnote at the end of this listing states that “Each of the Q12© statements above represent millions of dollars of investment by Gallup researchers…..”. This is one of the reasons these Gallup books are interesting. There is lots of data embedded in them. It is well worth the time to read through and absorb the anecdotes that flow from the data. The questions I have about this list are not about the validity of these statements. They seem to jive very well both with anecdotal observation and the findings of many other studies about the attitudes and feelings of people in high performance organizations. The questions facing a manager is how to create the business culture, infrastructure and processes that produces these results in the human resources of the organization? Without attempting anything exhaustive here, let’s take a look at several of these 12 elements and see how one might convert them into actionable tasks for a manager. Looking at the first two elements, applying Lean principles and practices creates an environment in which every person knows what is expected of them, how they are to accomplish the tasks, when the results are required, and what success looks like in terms of detailed deliverables of a product or service. And, they receive immediate feedback concerning all of these characteristics from those around them in the work flow. Since good Lean work design involves visual, simple feedback mechanisms, quality is a result of the process and failures are dealt with immediately. Apply Lean principles and practices develops processes that directly connect the work at hand to elements eight and nine. Central to Lean practices is the principle that quality is a outcome of the process and failures are identified in the flow and quality issues are resolved down to the root level. Element seven, “At work, my opinions seem to count.” requires some further comment. High performance organizations require the involvement of every associate’s mind and energies to solve problems and carry out the work at hand. It is not optional in a high performance environment. So, by definition, every person’s engagement counts. The word “seem” needs to be replaced by “does”. A little further quibble here. Opinions are not very useful without the supporting facts and thought processes behind them. This is the reason that high performance organizations, whether they identify themselves under the banner of Lean((2)) , Baldrige((3)) , EFQM((4)) , or ISO9001-2008((5)) , use disciplined problem solving techniques that everyone learns to use. This assures that everyone’s engagement in the problem is represented, but the problem solving is fact-based, gets to the root, and is actionable. Element 10, “I have a best friend at work.” is clearly beyond the control of management. It is understandably nice, but definitely not a controllable element of any work place. Some elements are particularly subject to influence by the behaviors of senior management. Elements 3, 4, 5, 6, and 11 are typically elements to be found in high performance human resources management processes. But, making those processes come to life can readily be driven by the example of senior management in how they manage the selection, development and pruning of the people who report to them. If they practice sound high performance human resource practices, those practices will cascade down to everyone in the organization. It goes without saying that a component of that is direct involvement by senior management in oversight and monitoring of the health of the human resources management processes in the organization. A simple example of this is to impose a rule that no manager, even to the CEO level, can receive a pay grade review if they have any outstanding performance reviews for their subordinates. This drives timeliness quite nicely. To conclude, this list of 12 elements is an interesting starting point to venture into high performance management. The list is really a slice of the results that flow from high performance management practices. The trick here then is to reverse engineer the list to uncover high performance practices from the world of Lean, Baldrige, and other high performance models that can be applied in your particular business environment. Building a high-performance organization is one sure approach to developing an organization that produces great results and solid answers to the 12 elements of great managing as described in 12 The Elements of Great Managing by Rodd Wagner and James K. Harter. This entry was posted in Book Reviews, Business structure, Functional Skills, People, Quality System and tagged 12 The Elements of Great Managing, baldrige national quality program, EFQM, high performance organization, human resources, iso 9000 standards, James K. harter, Lean, lean principles and practices, People, Rodd Wagner, strength by Mark Orton. Bookmark the permalink.